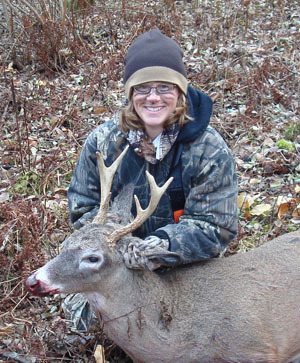 "Mom Gets Her First Buck"
I shot my first deer ever, it happened to be a 6-point buck!!!! Since I have three boys, (husband and 2 sons), my husband has been hunting all his life, my oldest son 3 years hunting and my youngest son turned twelve Nov 3rd and he is starting to hunt. So, I thought I would try bow hunting. I had hunted as a little girl with my dad, but never got into it as I got older. It was Friday morning, November 11, 2011, I had planned on taking the day off from work, one because my boys had no school and two I could take my youngest son hunting. Off I went by myself since Brett (12yr old first deer) had gotten his big buck earlier in the week. I was concerned about finding the trail by myself, I had an issue in the past finding it – LOL. I hung up my scent canister on a tree about 10 yards in front of my stand. I got up in the stand and all set up. I had my bow hanging next to me and hands tucked into my hand warmer pouch, I’m not a cold weather girl. I had been sitting about thirty minutes and saw a deer out the corner of my eye. It was about 35 yards away and coming closer into my direction. Thinking to myself, "That is a buck and I need to carefully get my hands out of the warmer, grab my bow, stand up, draw back all without him seeing me. Oh great!!!" Well, as I was taught, wait till he gets behind a tree and make a move so that is just what I did. It didn’t seem like there was enough trees he could walk behind for me to get ready. He is now about ten yards away, right in front of my stand and next to my scent canister. My bow is in hand, I’m still sitting and he is standing still and I’m waiting for him to turn his head so I can draw on him. It feels like forever. He’s got his neck all stretched out and sniffing the air. That was very cool to watch him and at the same time I’m thinking turn your head. Yup, he turned his head and I drew back, put my pin on him, waited a few seconds and pulled the trigger. I heard the arrow hit him and watched him run. He crashed into some thick brush and I saw him fall. He was about 50 yards away from my stand. I waited an hour before I got out of the stand. I kept looking at him making sure he didn’t get up. I thought he was a 4 pointer. My husband and oldest son went with me to get him. He ended up being a 6 pointer!!! This was a very cool experience and even cooler thing is that my family has shot their first deer from that very same stand.